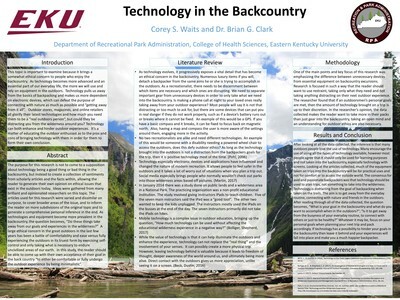 The purpose for this research is not to come to a supposition about technology being a good thing or bad thing in the backcountry, but instead to create a collection of sentiments from scholarly articles and the facts within, allowing the reader to generate their own opinion on ethical issues that exist in the outdoors today. In this assortment of articles there are ideas gathered from many brilliant and opinionated researchers. The articles in this research were varied and dissimilar on purpose, to cover broader areas of the issue, and to inform the reader on more subdivisions of the original topic and to generate a comprehensive personal inference in the end. As technologies and equipment become more prevalent in the backcountry, the question becomes, “Do these things take away from our goals and experiences in the wilderness?” A large ethical concern in the great outdoors in the last few years has been a battle of comfortability and ease versus fully experiencing the outdoors in its truest form by exercising self-control and only taking what is necessary to endure uncivilized areas of our earth. In the study, the reader should be able to come up with their own acceptance of their goal in the back country “to either be comfortable or fully undergo the outdoor experience by being minimalistic”.